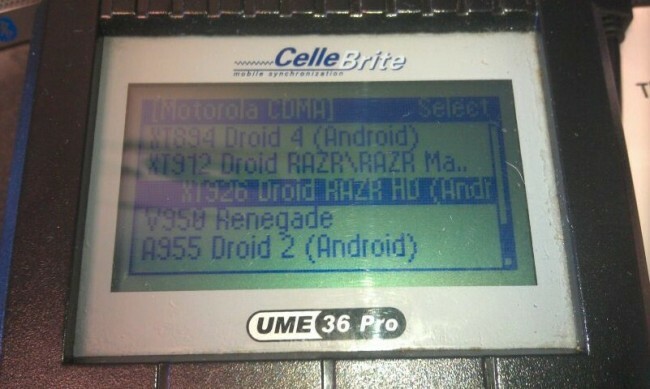 The DROID RAZR HD by Motorola is starting to appear in Cellebrite systems for 3rd party retailers, giving us at least some sort of a sign that the phone is still on the way. Previously codenamed the DROID Fighter, we thought that this phone would have been out by now (previous targeted release dates), but Verizon and Motorola seem to be taking their sweet time. Other than this being in Cellebrite systems, we can’t take much else from it except the model number of XT926 which matches up to previous sightings. According to benchmarks, pictures of the phone, and other back alley rumors, we are expecting the RAZR HD to have around a 4.6″ HD (720p) display, on-screen navigation keys, a 1.5GHz dual-core Snapdragon S4 processor, 1GB of RAM, a 12 or 13MP camera, Ice Cream Sandwich, and 4G LTE. Think of it as the ultimate RAZR, assuming it has the MAXX’s 3300mAh battery. I know that Motorola still gets plenty of hate from the developer community, but I’ve got to admit that I’m pretty excited about this device. After seeing what they have done to Blur and Android 4.0, and then imagining that with an HD screen, beast processor, top notch camera, and on-screen soft keys, how could you not be?